Surrounded by Colorado's towering snow-capped mountain peaks, numerous mighty rivers wind their way down into warm and lush mountain valleys. Many of the nation's best rafting rivers have their headwaters here, and the state is considered by many to be the U.S. capitol of whitewater action. Whatever your speed or experience, from mild to wild, rivers such as the Colorado, the Arkansas, the Dolores and the North Platte provide something for everybody. Outfitters will provide the gear you need for a fun, safe experience on the river. That always includes a life jacket and a helmet for difficult paddling trips. Additional gear like wetsuits, splash tops and booties for the feet are rented for a small fee. Water sandals or old tennis shoes are also good footwear. Wool socks inside booties work well in Colorado's frigid waters, and bring a fleece or Polypropylene top or jacket. Swimsuits are usually worn underneath wetsuits. Leave cotton garments in the shuttle vehicle that will meet you at the "take out," where your trip will end. Waterproof cameras with an elastic band are perfect for river trips. Just loop the camera handle through the bottom buckle of your life jacket and you're ready to record the action. Don't forget waterproof sunscreen and "Croakies," or a string to secure sunglasses or prescription glasses. Favorite baseball caps and jewelry should be left in the car or at home. T-shirts, photographs and other mementos are traditionally available at the end of the trip, and many guests will pass on a tip to their guide, so bring a credit card and some cash. Colorado rivers are fed by the winter season's snow melt, also called run-off, so May and June are "powder season" for river aficionados. Even July can bring big water flows and frigid water temperatures. 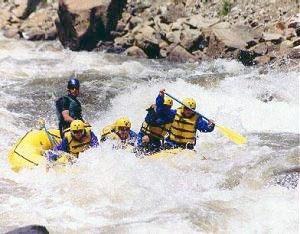 Later in the summer, water flows subside, exposing rocky river bottoms that create technical paddling circumstances on most Colorado rivers. As the water level drops, some rivers become more challenging and others that are not runnable during high flows are perfect for commercial rafting by mid-July. All said, the season is generally from May to September. A good river guide can be like a favorite high school coach or the funniest waiter you ever experienced. Guides are professional leaders, safety experts, storytellers, scientists, comics and chefs, all rolled into one. If you are a first-time paddler, just be yourself. Most guides are biologists, geologists and historians wrapped in a friendly, deeply tanned package, so if you are a birder, wildflower fanatic or a history buff, don't be shy about asking questions. And don't forget to make friends with the rest of the paddling crew! If you have a great time on the river, remember the guide's name and request your new amigo the next time you go paddling. It's important for individuals to understand their limits before agreeing to run a certain section of river. Consider physical abilities, such as how much you exercise at home, and whether you want to be an aggressive paddler before agreeing to join a group on a Class 4 to 5 trip.